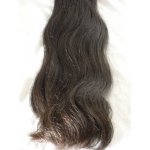 100% Double Drawn Remy Straight Indian Hair. Bundles range from 3.0oz to 3.5oz. All Hair is Virgin. Hair can be flat ironed. Any coloring should be done by a professional stylist to protect your investment.